A huge family room with seating for everyone centered around a roaring hearth sounds idyllic – because it is. You aren’t going to find that in most urban homes. Nor are you likely to find a giant room with a king-sized bed, plenty of seating, dressing areas, and a fireplace. Most urban spaces are either small or just small in perspective, not providing the space we would like to deal with all of life’s demands. We want our bedrooms to be places we can sleep, relax, study, exercise, and accommodate guests, but they are typically only large enough to create comfortable sleeping areas for ourselves. Expand Furniture has several sofa wall beds that can fit your space, but the Murphy sofa sectional Clean Wall Bed is ideal for an urban bedroom. It offers plenty of seating room, including a chaise for when you want to stretch out with a good book but you aren’t ready to settle into bed. You can keep the bed put away during the day, when you’d rather use the room as a communal space. For example, you might use this bed in a child’s play room or a home office. 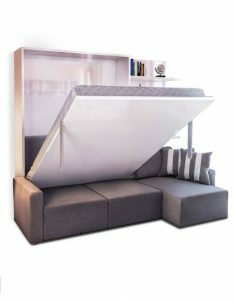 Then you can pull down the bed when you have guests or when you need to turn the room into a bedroom at night. The Clean Wall Bed is a gorgeous sofa wall bed with simple lines that are perfect for any modern décor. 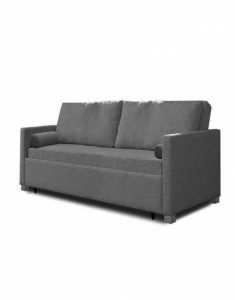 The couch is unfussy, but it’s not plain – it’s sophisticated and contemporary. It comes in gray or sand, which you can dress up with accent pillows with pops of color. The bed comes in a white gloss, and it is flanked by shelving for books or décor. The primary way that modern sofa beds excel over traditional sleepers is that they have much more comfortable mattresses. The Harmony Renoir sofa bed has a queen-sized memory foam mattress that will feel like sleeping on a cloud. The memory foam supports sleepers in all the right places while offering a sumptuous, soft sleeping area everywhere else. The foam contours to the sleeper’s body, providing all the right support. Meanwhile, the Harmony Renoir sofa bed has a simple yet sophisticated design that fits right in with urban bedrooms. It has a stately gray fabric and clean lines, and it can blend with any modern décor. Put this sofa bed in a guest room or home office to easily accommodate guests when they are in town. The mattress converts effortlessly so you don’t have to fuss when everyone is tired and ready to sleep. 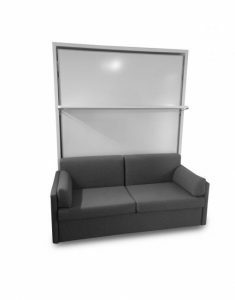 The Compatto is a stylish sofa wall bed that includes a floating shelf on the cabinet. The floating shelf allows you to put things like books or decorative items over the sofa so that there is not a plain white background there. When you pull down the bed, you don’t even have to take things off the shelf. The whole piece swings down so that it hangs below the bed when it is in use. 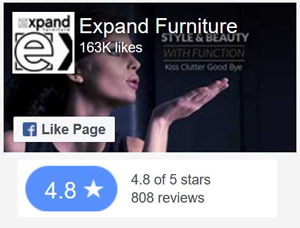 The sofa itself features the same contemporary design of many of Expand Furniture’s other space saving sofa beds. The back sofa cushions push down easily when the bed comes down, so you don’t have to move the sofa out of the way to use the bed. The whole unit is designed for ease of use and maximum comfort when sleeping or sitting. Finding the perfect sofa wall bed for your urban bedroom is about finding the right combination of style and comfort, and all of these beds fit the bill. 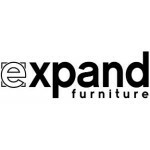 Expand Furniture has many other space saving sofa beds that would be idea for your urban bedroom or really any other room in your contemporary home. These sofa beds feature European styling, high-quality fabrics and other materials, and expert craftsmanship that makes them easy to use. You can put these modern sofa beds in your home to make better use of the space and to elevate the décor. 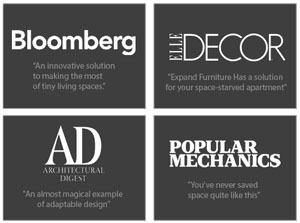 Explore our online catalog to find the perfect sofa wall bed or to explore our other space saving furniture options. 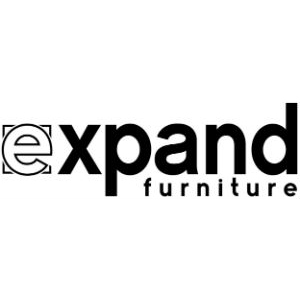 We have everything from sleeper sofas to modular wall shelves to transforming tables.